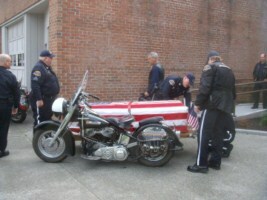 Leroy Imboden Jr., 80, passed away at the family home October 12, 2010 after a very short illness (cancer). He was born February 27, 1930 to Roy and Genevieve Imboden in Centralia, WA. After joining the United States Navy in 1947 he met and married Helen Litton. After his tour in the Navy he attended Washington State University and later became an engineer with Boeing where he worked on the Lunar Rover Vehicle project. 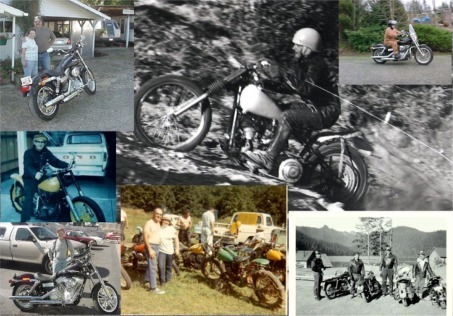 Leroy’s passion for motorcycles began at his father’s Harley shop in Chehalis in the 1930′s and he enjoyed riding until his recent illness. 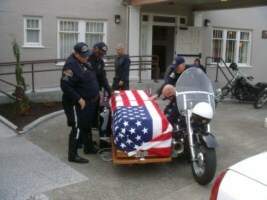 He retired from Boeing in 1974. 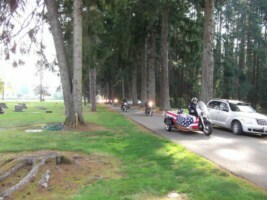 He enjoyed hill climbing and was a member and President of the Jolly Rogers Motorcycle Club. Leroy was the last club member to win the 80″ Novice event at the Jollies club grounds hill climb and was President of the Jollies when the club purchased a house on Military Road, knocked out a wall and made it the Jollies clubhouse. He also created his wood toy business Pat’s Toys, where he designed and sold natural wood toys for 25 years. Leroy is survived by his son, Micheal Glenn, sister Barbara Rickert, brothers Bud, Bob, Mike, grandson Pat, granddaughter Tammie Mitchell and 4 great grandchildren. This entry was written by fingers, posted on November 6, 2010 at 9:50 am, filed under History. Bookmark the permalink. Follow any comments here with the RSS feed for this post. Post a comment or leave a trackback: Trackback URL. I was both surprised and pleased to see this saved in your archives!